Originally a New Yorker…I grew up north of Manhattan, spent many years on Long Island, moved to McCall, Idaho 10 years ago. My husband, Lex, is national level soccer coach; he has created a soccer legacy here at McCall-Donnelly HS in McCall, where none had existed before. His team was state champs 3 years, and achieved many athletic/academic awards for school and individual players. I re-started my art career here. In NY I was in the Real Estate business for many years, and advertising/marketing before that. 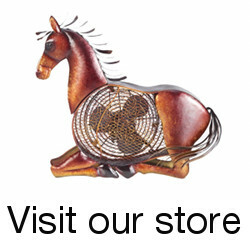 But always I was a lover of, drawer of and dreamer of horses. Moving out west re-ignited that for me, and my art career took off. When did you first start painting horses? 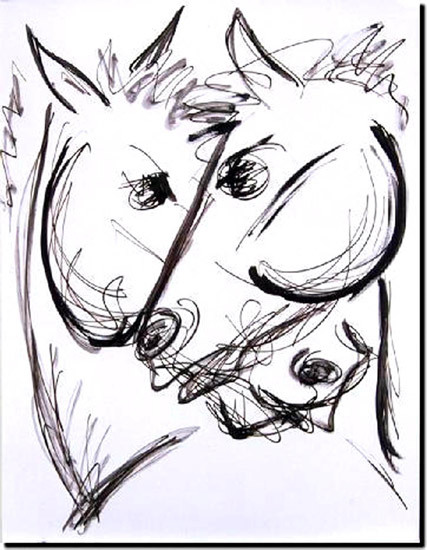 I first started drawing horses when very young, like so many others…always loved, unable to afford, so drew them to get close to them and create an intimacy with them. They symbolized so much of what I believe in: freedom, beauty, honor, dignity, trust, sensuality. Then my neighbors got horses, and I ended up being around them constantly…caring for and riding them…I think I willed them into my existence. In native American lore, and many other mythologies, horses are the messengers of the gods, and they are an ephemeral imagery for me…interesting, because my horses have been called “somewhere between heaven and earth”…or, as if “descended from clouds”, which is exactly the atmosphere I feel I inhabit, and gravitate towards. What is your favorite breed to paint? 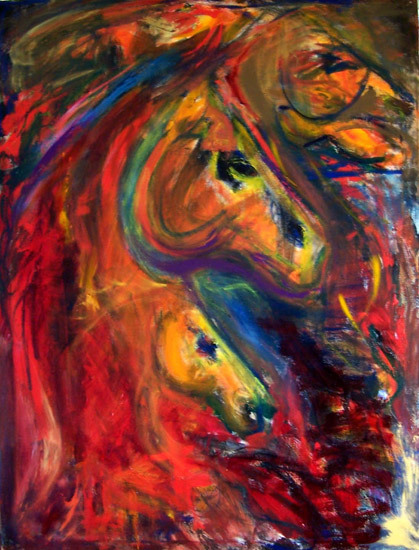 I don’t really concentrate on breed – I paint the essence of horse energy, as I feel/interpret it, and attempt to communicate those values they express and symbolize for me…their own energetic, a combination of physical and emotive poetry in action. But I think Arabians and Friesians have a stylistic anatomical quality that highlights that kind of energy for me. You use a variety of mediums, which one is your personal favorite to work with? I use just about all of them…I have tried a lot…but I think favorite is simple inks and chalks…they allow me to achieve the flow of what it is I am trying to express more spontaneously, rather than in a studied fashion. 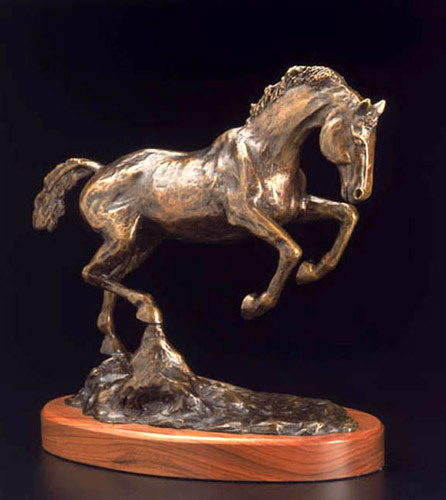 I also create bronze sculptures, Buck was created for The National Ability Center in Park City, Utah, in support of their national therapeutic horsemanship program. 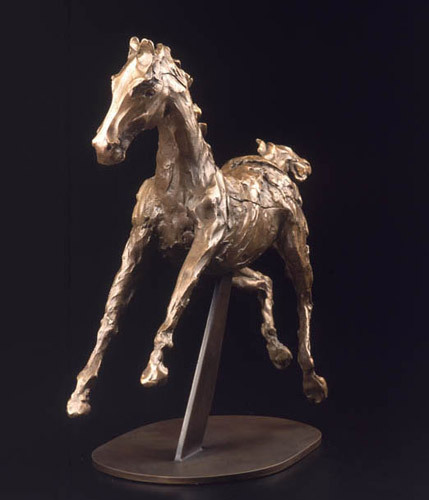 Creating in clay and bronze came late in life for me, but very naturally; I was so familiar with the equine anatomy, its richness and detail, that the three-dimensional forms seemed to flow right out of me. Gosling represents a bit more of an abstract feeling and texture, which is exciting to me in its own right. You do a lot of large commission work, do you enjoy painting large? One of my large scale pieces, Four Horses was created for a private home in Chicago as a commission piece. Large scale paintings are an athletic event on their own; I love the boldness and challenge of them. I also love working on commission with homeowners and designers creating unique pieces whether for residences or commercial locations. You don’t just paint horses, what else do you enjoy painting? 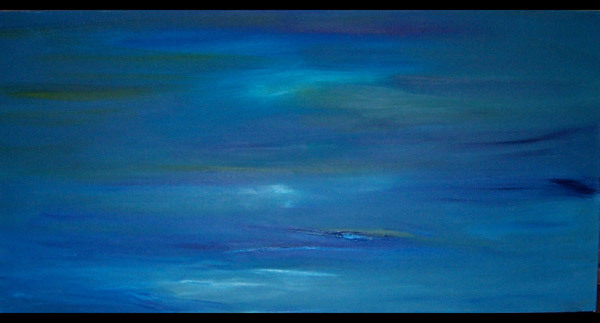 I also experiment in the abstract and landscape my abstract works represent my journey into color, expression & design. Early on, it was a painting called “The Horse Fair” by Rosa Bonheur in the 18th century. I first saw this picture in an old book about horses that my mother had. She was a horse lover, too, and first helped me to figure out how to draw horses. We would work together on my sketching, as she was an amateur sculptor and artist. This painting expressed just the sheer size and power of the energy of the horse, and inspired me. When I finally saw the original painting as an adult, I was floored…it is huge as well! About 12 feet wide and 9 feet high…gargantuan for a woman artist at that time – who were not allowed to be painting anatomy of any kind! Later, illustrators Paul Brown and Sam Savitt, CW Anderson and Wesley Dennis (all horse book illustrators); artists Georgia O’Keefe and Mark Rothko for color and style, minimalism and powerful effect; Pablo Picasso for being Picasso, and Franz Marc for presenting horses in clearly untraditional stylistic design and colors. Do you (or did you) have an animal that is the muse behind your work? 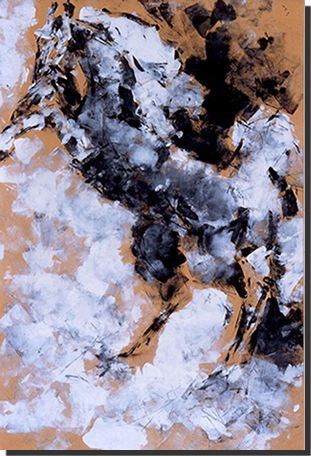 As a child I had an imaginary horse who followed me everywhere – accompanied me on every adventure – Storm King, immortalized in the piece of the same name, which I painted in High School, is in my permanent collection, and available only as L/E giclee prints. Do you have any secret rituals you do to help you get in the zone for your art? Music, dreams, sketching as if singing the notes in the scale…sketching small and large, round and round, to warm up my hands, fingers and arms, so they will then move freely and instinctively in the painting process. Is there a particular place that brings you inspiration? What effect do you think the Internet will have on art in general? The Internet is wonderful for art – I know there is a lot out there, but it is wonderful – allows art to be broadcast to and available to all in very simple fashion. Allows artist to market art to events, galleries, individuals with a push of a button – brilliant! Has it had an effect on yours? Absolutely! Proof is our conversation here! Which one is your personal favorite piece? 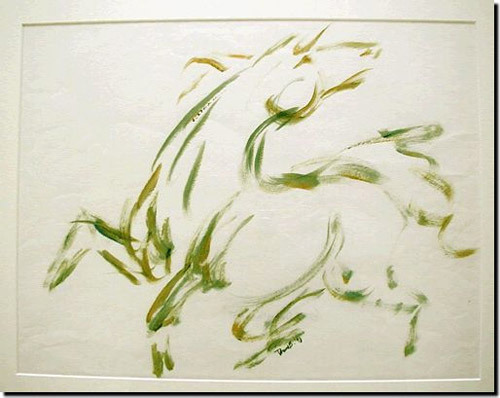 Other than Storm King, for obvious reasons, and a simple ink drawing “Running Wind” – for I first called my efforts “Running Wind Art”, my favorite artistic piece is “Horses for Pablo”. It is the product of a dream…one night I dreamed Picasso came to me, showing me artistry, drawing with me…I truly felt his full presence upon me. In the morning, I went into my studio, pulled out a piece of white paperboard, some markers and ink, and created this piece…my hands moved across the surface as if they were not my own…guided by an unseen energy…I was actually laughing as this was happening, it was so obviously an inspired moment, as if I was in it, but also a spectator…and this picture was born…many people have mentioned a Picasso influence in a lot of my work, and as you can see, there is not another image like this in my collections to date!! Would you ever sell it? No – I would not sell it! I am passionate about youth, the inspiration and wisdom of children; honor in today’s society, eliminating cruelty and pain on this planet, sharing, loving, dreaming and caring, living the beauty that is available to us in this lifetime. Always working on new things. Also enjoy delving into the world of the modern and the abstract. Love the sensuality of working in oils. Planning for the Celebration of Fine Art in Scottsdale, AZ from Jan 16 – Mar 28, 2010. So excited about this event – their 20 year anniversary – it is an amazing expression of the arts. Which one is your most popular piece? 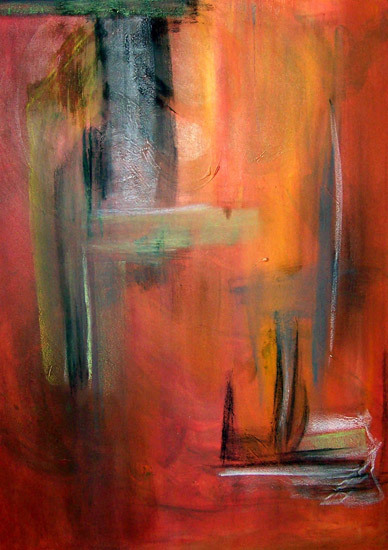 On of my most popular pieces is “Trio”, It was done on canvas 3 feet by 4 feet, oil over acrylic. 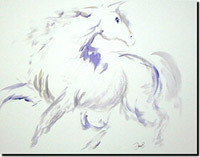 Through this piece I found there is a market out there for very abstract, unusual horse paintings. Thanks to Donna for answering the interview and sharing her work. 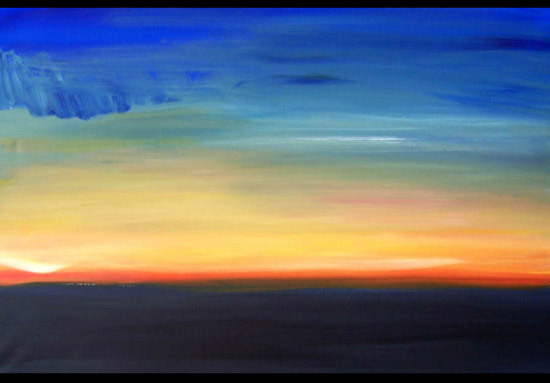 Be sure to check out her art blog periodically for updates about her latest works. Also stay tuned for more interviews with horse artists and photographers. Are you a horse artist or do you know an equine artist you’d like to see featured? Add your name and website in the comments below or drop me a note to get involved. This entry was posted in Interviews on August 31, 2009 by The Equinest. enjoyed this interview. hope you enjoy my work as well. I loooooove your bronze work! Really beautiful stuff!!! Donna, Ten weeks at the Celebration isn’t enough time to get to know people in the way one artist wants to know another. But reading this interview elucidated your work for me. I would say that I intuited these things, but having you articulate it makes the work “fuller” for me. People rarely have the opportunity to hear the artist speak about their work, and the Celebration is that opportunity. I hope you’ve had the chance to engage many in conversation about your work and that they will see with new eyes the beautiful simplicity and joy in your lines.